“If it fits in a box; put it in a box. Did you know – the average amount of time to pack a standard four bedroom home is two weeks? So, you’d better get packing! Get things moving with our move planner. Start with storage areas: Check all your storage areas, like the garage, spare room cupboards, linen cupboard, and garden shed to sort out which things you do or don’t want to take with you. Dispose of unwanted chemicals: Contact your local council about disposal of chemicals such as cleaning fluids, paints, solvents, gas bottles and fuel cans. They must not be poured down the drain, and are flammable which means they are too dangerous to transport (even for removalists) or to store. Deliveries: Cancel any door-to-door deliveries like veggies, milk or newspapers. Utilities: Arrange final readings for your utilities, and pay any outstanding bills. Phone: Arrange disconnection of your old landline phone, and reconnection of your new one. Library returns: Return anything you’ve borrowed such as library books or DVDs. Hold a market stall or swap party: Sell or share any clothes or furniture that you don’t want to take with you. Books: Ask your local second hand bookshop and take on any books you don’t want – you may be able to make some money from them. Donate food: visit the local food charities and donate any dried or tinned food that you don’t want to transport. minute items, just keeping separate for now the essentials you need on the day. Call us: We’ll talk through the final details of what is your responsibility and what the moving team will cover on the day. Label: When you pack, make sure everything is labeled clearly to allow for efficient placement in your new home. Pad your breakables: Pack up all your breakable items with special padding. Pack valuables: Pack a box of all your valuable personal items such as laptops, documents and jewellery. Most of our customers prefer to keep these in the car with them when they move; not on the truck. Secure liquids: Make sure all liquids are contained in securely fastened jars or bottles. The safest option is to pack them in plastic bags or a waterproof box. Coverings for windows, lights: Take down any window coverings and any light fittings you want to take with you. Laundry: Insects and mould love dirty or damp clothes so make sure all your laundry is clean and dry. Lawn mowers: Machinery such as lawn mowers, which use petrol, should be emptied prior to the pick up. Empty fridge and freezer: Remove all food and place in an Esky if applicable. Wipe the insides of the fridge and freezer down and leave them open to dry out for at least 24 hours. Pack all shelves and drawers in a separate, clearly labeled box. Disconnect your washing machine from the water supply and make sure any water left in the pipe is put down the drain. Strip bedding and take apart any beds which need to be moved (or we can do this for you if required). Drop off the pets and kids with their carer for the day. Take a final walk around the entire property, including the garden and garage, checking nothing has been left behind. 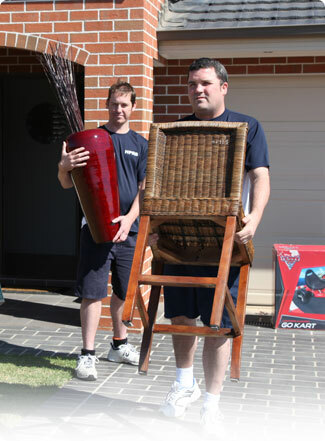 When the removal team arrives take us on a walk through your property, so we know exactly what is and isn’t going. It’s a great idea to label each box or item clearly too, such as ‘LEAVE’ or ‘ TAKE’. Items to keep at hand – let us know exactly which boxes or items you will need to have to hand when you arrive at your new place, as we will pack these items last to allow for easy access. Stay with the removals team until the very last box is loaded to make sure everything you wish to take with you has been included. Double check to ensure no items have been left behind, as this is your responsibility.